Imagine gliding across crystal-clear turquoise waters, catching glimpses of dolphins or pausing to fish and enjoy the views of sugar-white sand and beautiful foliage. Those who embark on Gulf Shores and Orange Beach sailing adventures get the opportunity to do just that. 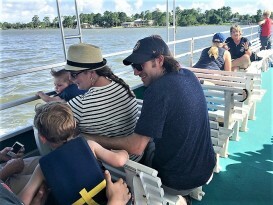 From the large expanses of Gulf waters to the tucked away back bays, there are many places in the area to explore by boat when on a sailing vacation. 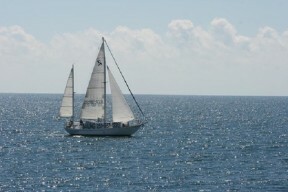 Gulf Shores and Orange Beach are excellent areas to sail from. The Alabama Coastal region is pristine and the waters are teeming with sea life. There are many options for getting out onto the water and each has its own benefit. Chartered tours allow you to see hidden pockets or special local gems. The cruise captains also know where the action is—whether it’s dolphin sightings, diving or the best fishing holes. While sailing is an activity in of itself, there are also many other options during your time on Gulf waters. Fishing – Fishing is prolific in Alabama's Gulf Coast. It’s also a straightforward process to find out about regulations, permits, what’s in season, and more. If you go the fishing charter route, guides will provide you with the information you need to kick off a successful trip. Some popular “catches” include grouper, shrimp, crab, king mackerel and mullet. Diving – It’s a true adventure to explore what lives under the surface. Diving is a popular sailing activity in the Gulf Shores area. During a sailing/diving excursion, you can check out wrecks, sea life and other treasures hidden in the depths. Nature viewing – From Perdido Key to Dauphin Island, Gulf Shores and Orange Beach holds many species of gulf coast birds, fish and wildlife in the water, air and on land. Alabama’s Gulf Coast is popular with birders who come to see numerous species and abundant seabirds here year-round. In the water, you’ll find dolphins, fish and maybe even a manatee. On the shores, you'll be sure to spot some sea turtles, butterfly migrations and alligators! For some people, bringing their own boat is considered the perfect vacation. Luckily for them, Gulf Shores and Orange Beach are boat-friendly areas. With 11 boat launches and plenty of parking, bringing your sailboat is easy. You’ll find many maintenance and repair shops as well as marinas stocked with the essentials for boating. The Gulf Shores sailing community is friendly and will surely send you to some stunning spots. Several outfitters offer sailing excursions with a captain. Some guides will whisk you across the bay and allow you to bring your own cooler of food and drink. Others take you on nature excursions, which are designed to show you the areas that have abundant wildlife viewing. 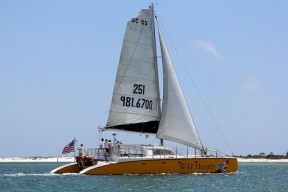 You’ll also find different times for Gulf Shores sailing tours. Dinner sailing is popular and catching an epic sunset is often the goal. However, all of the tours are ideal for capturing those picture-perfect scenes, so don’t leave your camera behind. If you have experience on the water, you may want to choose a sailboat rental instead of a cruise. 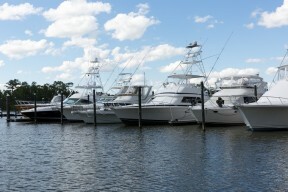 Gulf Shores and Orange Beach have outfitters that offer boat rentals for the experienced captains. 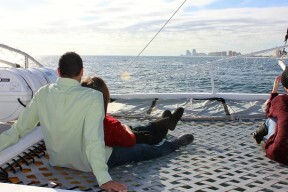 Sailboat rentals are an excellent way to explore the Gulf without a timeline. Talk to the locals about great spots and spend full days or more discovering the Gulf. Enjoy Holiday Musical Events On The Alabama Gulf Coast.